For decades, the challenge for the diamond industry has been a cumbersome value chain process for the flow of diamonds. This process is extremely labor and cost intensive with the need for a diamond to pass through many different intermediaries, before reaching the end customer. Each phase, requires a lot of logistics and paperwork and adds to the end price charged to the consumer. Before we can address the issue of why someone would want to list diamonds on a blockchain, we need to first look at the current supply chain process from procurement to the retail showcase. In the past, diamond sellers have been burdened in that every incremental phase of production creates additional costs. These include insurance, security, currency conversion, and paperwork. Additionally, there are possibilities for human error, theft, and fraud at every stage. The obstacle of a cumbersome supply chain has been an impossible to challenge to overcome, until now. The development of blockchain technology for the diamond industry supply chain is positioned to dramatically transform how diamonds are traded and sold. Blockchain technology is a way to shift the entire diamond supply chain onto a unified platform, where everyone has access to every detail of a diamond’s journey with complete transparency. The introduction of blockchain technology makes it now possible to mitigate past inefficiencies. A diamond blockchain platform allows for buyers and sellers of diamonds to communicate directly and more transparently and reduce many intermediary costs. This has the potential to reduce the final price a consumer will pay for diamonds. Retail consumers would have direct access to all the properties of the diamond including size, color, weight and cut. Additionally, photos and authentication certificates would also be available. The potential for listing diamonds on a blockchain and the reduction of centralized intermediaries has two primary benefits. For end consumers, it means a reduction in the final price paid, but sellers also stand to benefit. The reduction of middlemen would provide for wider margins even with lower prices, providing for a win-win solution for both parties. GLITZKOIN on our diamond-trading platform will only list certified diamonds from the GIA (Gemological Institute of America). GIA is the most recognized and trusted gem and diamond certification body in the world. GIA’s grading laboratories are favored by the world’s, most reputable jewelers. Certifying diamonds on the blockchain could potentially revolutionize the entire diamond supply chain and the “Trustless Transactions” would provide greater efficiency and margins to sellers. 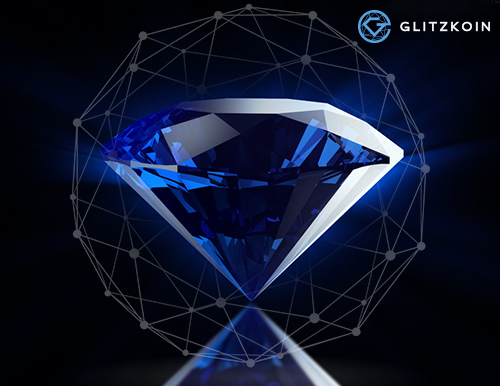 GLITZKOIN understands the economic benefits of being able to certify, and then list your diamond directly on the blockchain and making it publicly available to anyone in the world. We seek to use blockchain technology to modernize the way business is conducted in the diamond trade. Building a blockchain based diamond-trading platform will let us continue to be a leader in the diamond industry.